Tekno Comix (later called Big Entertainment) launched their line of books by hiring big name creators to come up with concepts that were then expanded upon in comics form other writers and artists. One such title was I-Bots, which was created by Isaac Asimov, the mind behind I, Robot and other influential works. 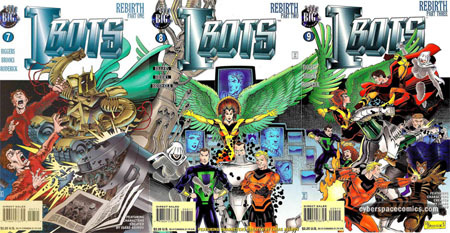 The final three issues of their second series combine to form one image.